Do you think KPI’s (Key Performance Indicators) are boring? Be truthful! They usually are. But not anymore. You see… most entrepreneurs kinda hate getting “homework” from business coaches. But when we give you “playwork” instead it can be really fun. What if you had a “board game” that you could use to grow your business? What if this “board game” could turn your frustration into elation? We decided to tackle one of the most boring topics - KPI’s - and see if we could make it “playwork” instead of homework. And we nailed it with a KPI board game that actually makes it fun to implement KPI’s and watch your business begin to thrive. KPI’s are all about knowing what numbers are critical to the success of your company. They are the metrics that identify and drive growth in your company. Once you identify them, playing our KPI game will move you step-by-step through a plan to reach your KPI goals. And I can prove that if you play this game, you WILL make more money and save more time. Playing the KPI game really does grow your business! David Lokker owns Landshark’s - an outfitter store in Michigan. He first started following my blog about four or five years ago, and we eventually started to discuss how he could use the KPI game to grow his business. You see, David was frustrated in his fight against a pretty big Goliath. But where there is frustration, there is usually a KPI opportunity! So he started playing the KPI game…and he quickly found it would be the one small rock he needed to knock his Goliath down. Landshark’s sales per square foot were stagnate, even though their overall revenues had grown. For David, sales per sq ft is a main KPI. Yours might be different. If you don’t identify the main things that indicate and drive growth, you won’t be able to plan activities that will impact those things. David took a detailed look at sales in the first half of the last three years to evaluate just exactly what the progress (or loss!) was in sales for each category. One of the things he noticed when he did, was lackluster sunglass sales. They simply weren’t selling as many sunglasses as they should have been. David didn’t understand this. They had the corner on this particular market in their area and little competition. So he watched how the sales team approached sunglass sales. What he discovered was that his sales people were reluctant to push sunglass sales. They were even reluctant to open the sunglass case! Want to learn how to play the KPI Game in your business? to schedule a free “Gamemaking” session with Jon! Limited spots are available on a first come, first serve basis. David knew that his demographic almost always bought a pair of sunglasses if they tried them on. So getting his sales team to approach people about sunglasses and increase how often the sunglass case was opened was pretty critical to making sunglass sales! David put together an incentive plan for sunglass sales. Every time a sales person assisted a customer by approaching them and opening a sunglass case, that sales person got a $1 scratch off lottery ticket. If that interaction resulted in a sale, that sales person got a $2 scratch off lottery ticket. While exploring the lackluster sunglass sales, David had learned something from his sales team. Most of his sales team felt inadequately trained to answer questions about sunglasses. He remedied that by training them and designating one sales person to be trained even more extensively by the sunglass brands themselves. This training allowed his sales team to say “I don’t know, but here is someone who can answer that for you” to a customer. Then he trained them on the reward system he was implementing. He wanted to make sure they knew the goal they were working towards, why they were working towards that goal, and what reaching that goal meant for them. David set up a very simple system to track how many times each sales person was given a lottery ticket for opening the case and how many times each sales person was given two lottery tickets for making a sale. And the results were rather amazing! In the first weekend that he tracked sales, they sold almost 5X more sunglasses than that weekend in 2015! And on the second weekend that he tracked sales, they sold about 3X more sunglasses than that weekend in 2015. For a $150 investment, he generated about $5,400 in sales. And the only drawback David says he experienced was the dirty feeling he got buying the lottery tickets since he doesn’t gamble. 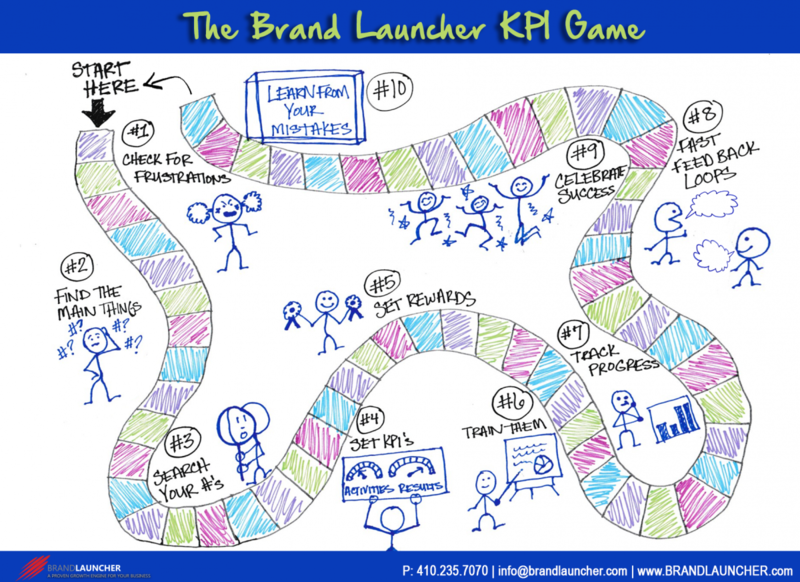 Are you ready to start playing the KPI game yet? For a free “gamemaking” session with Jon! David knew that keeping employees motivated was important. And he knew that getting feedback from them was critical if he was going to be able to measure the success of the reward program and make any adjustments that might be needed. So he made sure that employees got the instant feedback on what they were doing right and what they could do better. And the instant gratification of their reward when the case opened and then again if a sale was made. Plus, he kept lines of communication open between him and his sales team for feedback he could use to make sure he was playing his KPI game in the most effective way. David says his sales team genuinely enjoyed getting the scratch off tickets, and he was really hoping one of them would win a grand prize like $50,000. None of them did - he thinks the biggest pot won has been $20 - but it hasn’t demotivated them. Playing the KPI game to increase sunglass sales was a huge success. As was another tine David played the KPI game to eliminate mistakes that were impacting sales in the shoe department. But there is a time when David played the KPI game that didn’t go so well. In fact, it flopped hugely. He had identified a frustration and set up what he thought was a great incentive system that would result in better employee performance. Literally within a few days he realized it was all going wrong. What the employee’s had actually been incentivized to do was catch others in mistakes. David wanted the program to get employees into the “how can I do this better” mindset. Instead it put them in the “how can I catch someone else doing it badly” and turned them into adversaries instead of teammates. So he closed the program down after just a few days and is currently brainstorming a new way to turn it into a game that will actually be fun. David is different than many. He’s an avid learner, but more importantly he’s an avid doer. You can be a KPI hero just like David! When you want to achieve something, the most effective thing you can do is mimic what others who achieve that something. If you follow this blog closely, you will learn more and begin to apply more. Which means you’ll win more.